Republicans have repeatedly asserted that the Affordable Care Act signed into law in 2010 (also often referred to as ObamaCare) will be, and indeed already has been, a “job-killer”. The Republican controlled Congress has voted repeatedly to repeal the health reform, starting once they took control of the chamber in January 2011 (with the first such bill titled “Repealing the Job Killing Health Care Law Act”), and with over 40 such party-line votes since then. But while the Republicans have vociferously asserted that the health care reform law has and will “kill jobs”, is there any evidence that such a law will indeed do this? The assertion is particularly odd as the major reform under the law, that of establishing competitive market exchanges through which the currently uninsured will be able to purchase affordable health coverage from private insurers, has not even gone into effect yet. The exchanges are scheduled to open only on October 1, and coverage will not begin for policies purchased on the exchanges until January 1, 2014. Once the law goes fully into effect, we may be able to find from the data whether the impact of the health reform law had a negative, or a positive, impact on jobs. But until then we can look at the impact a very similar reform that may shed light on what to expect. Specifically, what has come to be called “ObamaCare” was modeled on a very similar health reform passed in Massachusetts in 2006. That reform was signed into law by then Governor Mitt Romney on April 12, 2006, and entered into implementation in phases starting in late 2006. The poor were first enrolled into a subsidized health insurance program, and then competitive market exchanges for health insurance for other individuals opened on May 1, 2007. An individual mandate to have insurance from some source began on July 1, 2007. If this health care reform is a job killer, one would expect to find that job growth in Massachusetts from 2007 and for the next several years to be relatively slower than job growth in the rest of the US. The share of Massachusetts in total US jobs would then fall. Did that happen? The graph at the top of this post shows employment in Massachusetts (using BLS data) as a share of employment in all of the US from 1990 (when the series on state employment starts) to now, including the period before and after 2007. 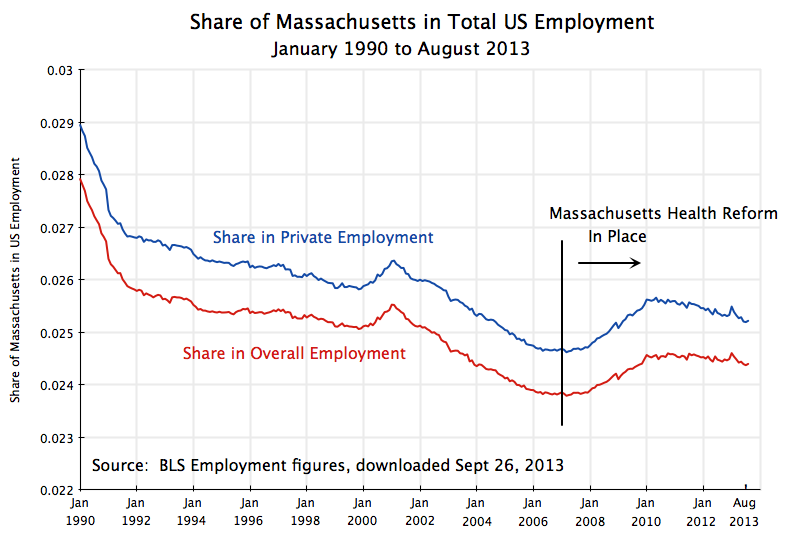 The Massachusetts shares of overall employment (including government) as well as private employment only, are shown. (The private employment share is higher than the overall employment share since the share of government employment in Massachusetts is relatively less than it is elsewhere in the country, despite what some people appear to assume). The trend from 1990 up to 2007 was for the share of Massachusetts in national employment to fall. Massachusetts is a relatively small and mature state, and employment in the US in the period was focused more on the Sun Belt states. But it is then striking how this turned around precisely in 2007, as the Massachusetts Health Care reform entered into effect. If such a health reform had been a “job-killer”, then the Massachusetts share in national employment would have fallen in 2007 and the following years. One would at least have seen a continuation of the previous downward trend. But instead the share turns sharply up starting in 2007, with this continuing to about 2010/2011 before it levels off and then perhaps resumes the previous trend. One should of course not put too much weight on this one observation. There was much else going on in the economy at that time, which might account for why job performance in Massachusetts was relatively better than elsewhere in the US in 2007 and subsequent years. In particular, the economy collapsed in 2008, in the last year of the Bush Administration, pushing up national unemployment in 2008 and 2009 until the stimulus program of the new Obama Administration plus aggressive Fed actions turned this around. The 2008 collapse could have differentially affected Massachusetts. However, the change in the trend in Massachusetts began before national unemployment started to rise. Furthermore, while one sees also a similar (but much smaller) peak in the graph starting with a rise from the beginning of 2000 and then a fall in 2001, this rise and fall did not coincide with the increase in unemployment during the first few years of the Bush Administration. National unemployment started to rise only in January 2001, and then reached a peak in June 2003. Finally, from 1990 to June 1992 there was also a rise in national unemployment, during the Bush I Administration, but this coincided with a steady fall of the share of Massachusetts in total national employment over the period. This was the opposite of the pattern seen in 2007 to 2010. There does not appear to be a consistent pattern that the Massachusetts share of US employment rises in recessions, so one would need to be careful to argue that this must explain what happened in 2007-10. The rise in the share of employment in Massachusetts in overall US employment following the implementation of the Massachusetts Health Reform in 2007 is therefore consistent with the view that such reforms are not job-killers. Following the implementation of the health reform, job growth in Massachusetts was relatively faster (or job cuts were relatively slower, during the peak of the downturn) than elsewhere in the US, with this lasting for several years. While too much should not be read into this finding and assume that it implies health reform will spur a sharp increase in jobs, it is certainly not consistent with the assertion made by the Republicans that such health reform will necessarily be a dramatic killer of jobs. This entry was posted in Health Reform and tagged entitlements, health reform, job creation, jobs, policy, unemployment by aneconomicsense. Bookmark the permalink.